Greci Loft is unique in its kind, representing the perfect combination between an historical Venetian home and a modern penthouse. The style of the architect who designed (and owns) this apartment is airy and fresh. He preserved traditional elements such as Terrazzo flooring and wooden beamed ceiling and created a spacious gallery that works as a double bedroom/studio with a truly Venetian view of the well-known Chiesa dei Greci and Venice rooftops. The apartment is also composed of a large living area with a beautiful crystal table for 6 people and an elegant sofa, a fully equipped kitchen with four burners stove, a standard size double/twin bedroom and a spacious bathroom with bathtub. Some other amenities are Wi-Fi internet connection, TV, CD played, dishwasher, washing machine, oven and air conditioning that is available in every room. The Greci Loft measures over 110 square meters and it is a third floor with no lift. The location is central and very convenient: the water taxi can drop you off right next to the apartment, the Vaporetto depot of San Zaccaria is only two minutes walk away, while Piazza San Marco maximum five. You can find excellent food shops and Venetian specialities stores in that street. 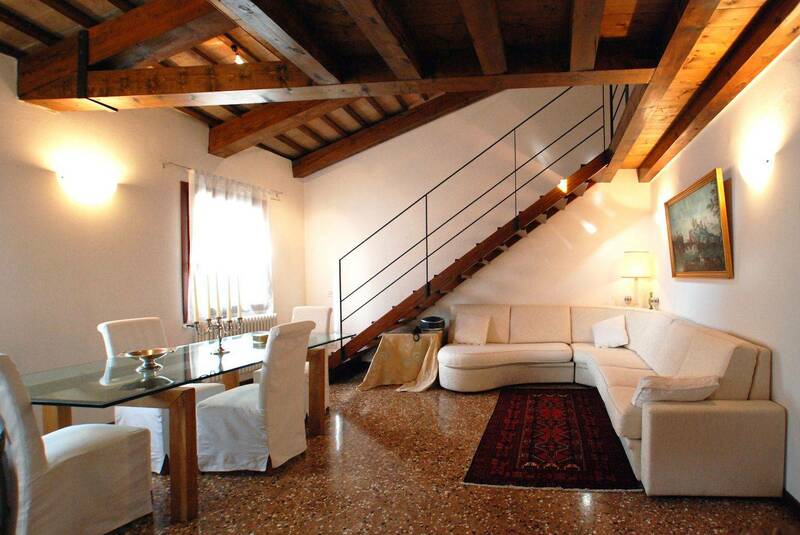 The Greci Loft is an elegant and spacious attic with nice view in excellent location, well priced and comfortable. 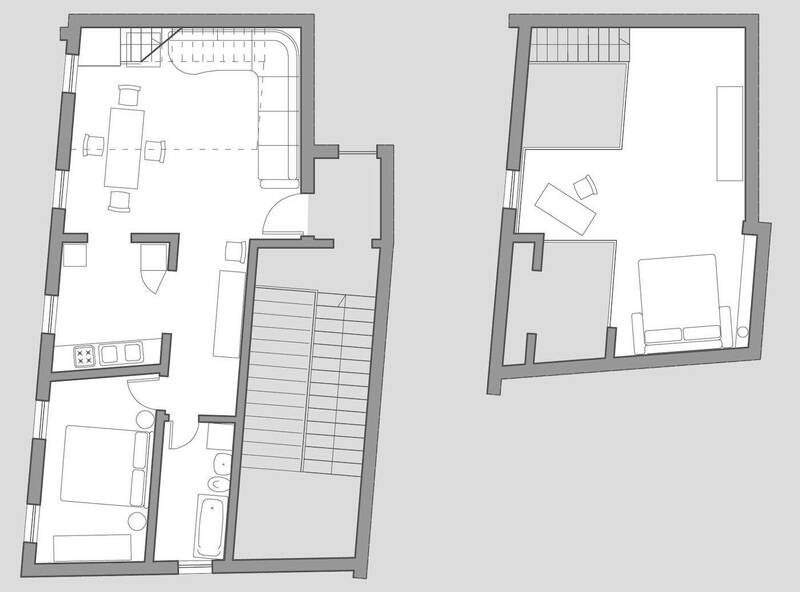 This apartment can be combined with the Greci Studio, on the same floor of the building, to accommodate up to 6 people. Great apartment and location, and very good arrangements - all went very smoothly. Beautiful Greci Loft! We enjoyed our stay at the Greci Loft. It is spacious and comfortable. It is a third floor apartment; stairs are the only access. Keep this in mind if you have trouble with stairs or lots of luggage. Management was excellent. They contacted us in advance, and greeted us at the Vaparetto. After the initial meeting with information about the loft, if we had questions, answers were immediate by phone. We only had one problem. It was very hot when we were there, and the air conditioning units were just not up to the task of cooling the loft down. They were running constantly, and I was concerned about the extra cost, but management covered it. Thank you for a great stay. Beautiful apartment right in the centre of Venice. We received excellent service and information before our arrival in Venice - on arrival, we were met off the boat, guided to our apartment, and were able to ask about how things worked in the apartment, which was very helpful. The apartment itself was lovely, quiet, warm, well equipped, nicely furnished, and very well appointed. We were very comfortable there, and were sad to leave. We will most definitely come again in the future, and recommend Truly Venice for their high standards of personal service.